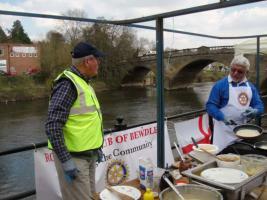 The Rotary Club of Bewdley has traditionally operated a Fund Raising Committee (FRC) to support the work of other formal Committees, notably those of Community Service, International Service and Foundation. Quiz Nights are held regularly at various venues and raise in the region of £1000 each time. Our pig roast at Bewdley Christmas Market along with the associated mulled wine and chocolate marshmallow sales can be relied upon to raise another £1000. A comedy and laughter night is organised each year, normally in March, and is now held in the refurbished St George's Hall in Bewdley and raises in excess of £1000. We have a presence selling chocolate covered marshmallows at the Bewdley St George's Day Market and organise pig roasts for other events and organisation in the Bewdley area. We have even done a pig roast at a wedding. In 2017 we held our first Golf Day and thanks to The Bewdley Pines Golf Club for handling the golf side of things we organised, hole sponsorship, a grand draw and a tombola. That year we distributed the proceeds of £4000 to 19 local charities and good causes and learned a lot. 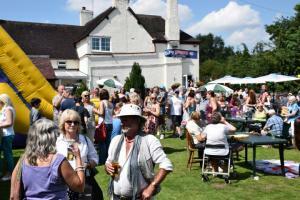 In 2018 we raised £5000 and this event looks like becoming an annual fixture.